The 68 metre motor yacht Lady Christine has had a central agency change and is now jointly listed for sale by Burgess with Superyacht Sales & Charter. Designed by De Voogt Naval Architects, she was built in steel and aluminium by Dutch yard Feadship to Lloyds class and delivered in 2010 with a refit in 2015. A capacious interior has been designed by Rodney Black Design to accommodate 10 guests in five cabins. 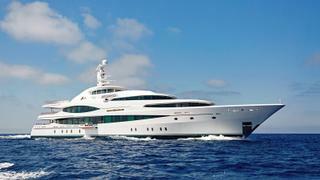 There is also accommodation for 21 crew in an additional 11 cabins aboard this yacht for sale. Her split level deck above the wheelhouse has been designed to house a master suite on its own deck with an observation room offering 180 degree views, a sitting room, private dining room and a vast en suite bedroom. Below, accommodation is for a further eight guests in three doubles and a twin, all with exquisite joinery in poplar wood, storage space, entertainment centres and en suite bathroom facilities. Additional features include a helipad, a large sun deck with a Teppanyaki grill, barbecue and pizza oven, a soundproof cinema with a 103 inch screen, and retractable sea balconies on either side of the dining saloon and the piano bar. Twin MTU 1,320kW diesel engines give her a tremendous range of 5,000 nautical miles at 12 knots and she is fitted with four Quantum zero speed stabilisers. Lady Christine is asking $69,000,000 with VAT paid.